In this post I am concentrating only on how to start with big data. However in my next post I will describes about the technologies that can be used or some of emerging technology in big data. However this post will only give you an overview of Big data. I do believe that Scrum is hard to adopt and for most companies this is just beyond their comprehension. They are fundamentally misunderstanding agile and trying to do agile rather than be agile. In my last post about agile methodology discussed about agile and today came with scrum. So the first question that arises in our mind is what is this and why should I know this? Yes we will take that but before that let me tell you why should you know this. If you are a developer, manager or product owner then this is sure for you. Agile is a general philosophy regarding software development while Scrum is an implementation of that philosophy pertaining specifically to project management.For many developers agile is not a new thing just the modified and advance version of waterfall model. 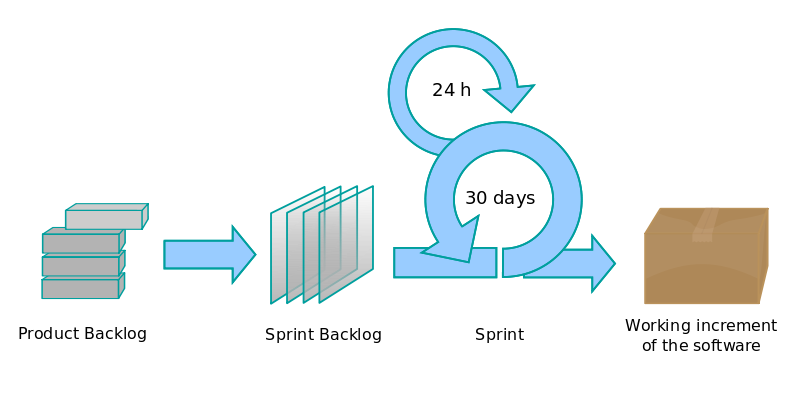 Scrum is an iterative and incremental agile software development framework for managing software projects and product or application development. Its focus is on “a flexible product development strategy where a development team works as a unit to reach a common goal” as opposed to a “traditional, sequential approach”. Pair programming is recommended in this strategy. The Scrum Guide is written and provided by them Ken Schwaber and Jeff Sutherland developed Scrum. Product Owner: The product owner is responsible for providing vision to all the team mates involved in development. He/She is also involved in maximizing the value of product.There should be only one product owner. Scrum Master: Scrum Master ensures that every thing is understood and clear. He/She may decides if anything is feasible or not(by consulting their expert team). Scrum master is responsible for maintaining the sprint backlogs. Yes for sure we will discuss sprint. Keep reading.. Team : Scrum team is the members of team, who are actually going to deliver things. A Team is made up of 7 (+/- 2_ individuals with cross-functional skills who do the actual work (analyse, design, develop, test, technical communication, document, etc.). The Team in Scrum is self-organizing. Sprint: A sprint is the basic unit of development in Scrum. The sprint is a “time-boxed” effort, ranging between one week to one month. Some professional even calls it as the Heart of Sprint. Daily Scrum : The Daily Scrum is a 15-minute time-boxed event for the Development Team to synchronize activities and create a plan for the next 24 hours. What we did since last meeting? What we are going to do before next meet? Is there any challenge that team is facing.